Thunder (Gregory) returns in this third installment, wrapping up the trilogy. This time around, our old pal Thunder is STILL trying to live in peace in the American West, even mentoring a young Indian boy named Little Owl (Jeffrey Domo) in his Native American ways. When a group of rowdy rednecks led by Magnum (Pochath) assault and even torture Thunder, seemingly just for kicks, Thunder wants retribution. Yet again he seeks the help of local law enforcement, this time in the form of Sheriff Jeff - yes, just Sheriff JEFF (JPL). Naturally, Sheriff Jeff is unable to help Thunder, so Thunder takes the law into his own hands once again. Because he was promised a rather modest sum of $53,000 to rebuild his Indian village, and he didn’t get it, Thunder just goes on a rampage of large-scale vandalism and property destruction, eventually blowing up the businesses of the local good ole boys who wronged him. Will Sheriff Jeff be able to stop the madness? Or will the one-man Native American wrecking crew that is Thunder proceed to take down the whole local economy of Las Cruces, New Mexico? If you’re watching Thunder III (by now, the filmmakers are assuming we’re so familiar with the character that they dropped the “Warrior” from the title), it means you really care. And if you do indeed care about the Thunder saga enough to stick through three entries of what is essentially the same movie over and over again, then this movie is for you - and only for you. It almost feels like one last send-off for fans of the trilogy, because there’s nothing here we haven’t seen before, and it appears the filmmakers did indeed presume some prior familiarity amongst the viewership. In other words, no one’s going to START with Thunder III. You’re here because you want to be. It feels like there’s less budget to work with this time around, and there probably wasn’t a sky-high budget to begin with for the other two movies. Thus, it has a junkier overall feel. But that also may be because they stretched out what, in another movie, would be one or two sequences into a whole 82-minute feature. Consequently, there’s not much actual movie here. The lack of substance makes the whole thing feel a bit off, like you’re expecting some context or some other events to occur - but, as stated earlier, maybe Ludman felt that was not needed because, in his view, the audience had all the context they needed. So Thunder can be free to beat Bounce fabric softener boxes off store shelves with a bat with impunity. Pochath stands out, as usual, as the leader of the rednecks, and there are some nice locations and decent blow-ups, but it’s kind of “been there, done that” - Thunder faces the usual red tape, he gets revenge, there’s the Prerequisite Torture of the hero, and some “Indian racism” by the evil whiteys (who have goofy “Southern” accents even though it doesn’t take place in the South). Instead of Bo Svenson as the sheriff, as he was in the previous two entries, now it’s John Phillip Law, or JPL as we call him. We’d love to know what JPL thought about all this. Someone should make a documentary about the actors that appeared in these Italian productions. Maybe we can somehow know Oliver Reed or Richard Harris’s feelings about their time making these things. As you might imagine, by the time of Thunder III, everyone was out of ideas and the franchise ran out of gas. There wasn’t really all that much there to begin with. It’s more a testament to the ingenuity of the Italian film industry than anything else. They could whip up a movie out of nothing, like taking a little leftover garlic and pasta and coming up with a reasonably satisfying meal. Unfortunately, nothing here sticks to the ribs. 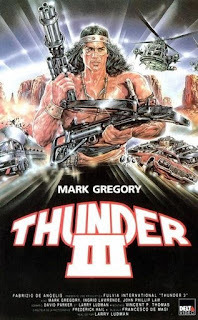 Even still, it was released on Imperial on VHS in the U.S., meaning the whole Thunder saga made it to American video store shelves in the 80’s - which is more than you can say for a lot of other productions, Italian or otherwise. Thunder III is - pretty much exclusively - for fans of the first two. It’s hard to imagine anyone else getting on board with Thunder’s antics for a third go-round. I agree. The Thunder movies seemed to have less action and a smaller budget with every entry. The Italian studios were going out of business by the time this movie was made due to the implosion of the video boom. Fulvia Film still managed to survive for a few years after this, however. Dead-on comment. You're absolutely right, Roger. Poor Mark Gregory.